Football fans fill the stands during the Salukis' 50-17 win over the Murray State Racers on Saturday, Sept. 17, 2016, at Saluki Stadium. The SIU Board of Trustees will consider Thursday a new policy that would allow alcoholic beverages to be sold on university property during select campus events. A new law, which was signed by Republican Gov. Bruce Rauner in August, amended the state’s Liquor Control Act of 1934, which prohibited the sale of all alcoholic beverages on properties owned by the state’s public universities. Sen. Pat McGuire introduced the legislation for the Illinois Senate to allow booze and beer to be sold during campus sanctioned events such as sports games and concerts. But even if the board passes the new policy, it could be some time before it takes effect. 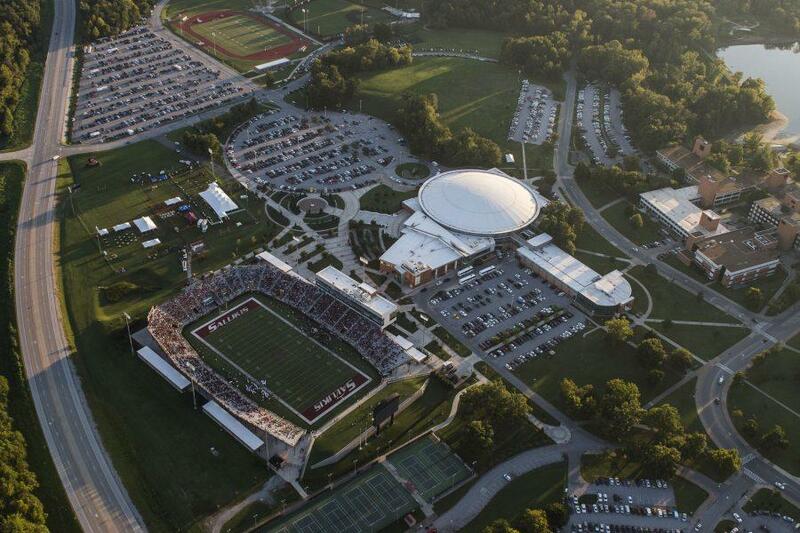 Bell said the policy isn’t just targeted toward athletic events, but also toward the SIU Arena aspect when pursuing and trying to book concerts. He said the policy could bring better chances of getting someone famous to perform at SIU while also helping to promote the entertainment and vendor used within the event. Once the bill was passed in the summer, it had to go through two reviews by the board of trustees before making a final decision, Bell said. He said once the decision is made, they will be able to go about making plans with their options pertaining to what venues will be used and what alcohol will be served. “This will be an entrepreneurial route to possibly enhance additional revenue,” Bell said. In the policy’s proposal for approval, supporting data showed that area schools have discovered a reduction in mid-day alcohol incidents on campus through regulated sales. The case study used was Northern Illinois University, one of the colleges that has implemented similar university policy changes. Illinois State University, Chicago State University, the University of Illinois and the University of Eastern Illinois are among other colleges that have been legally given the policy of selling alcoholic beverages during campus events that are considered non-student related. If approved, according to the proposal, the board will authorize campus administrators to amend policies, regulations and procedures to regulate the possession, service and sales and consumption of alcoholic liquors at facilities under the control of the board. “We have to look at the physical setting and group of people who are going to be attending and determine by age, if it’s relative to whether we can sell alcohol or not,” said John Charles, director of SIU’s government and public affairs. Charles said an important safeguard would be making sure that the places where alcohol will be sold are far away from student seating to prevent underage drinking. Another safeguard, Charles said, would be the importance of properly training those who are allowed to sell alcohol, which the campus has already taken initiative on. Staff writer Diamond Jones can be reached at [email protected], 618-536-3325 or on Twitter @_dimewrites.